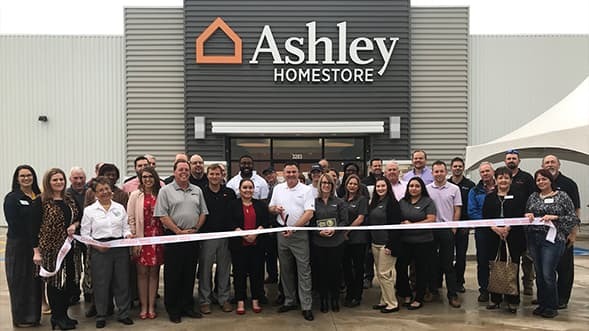 CORSICANA, Texas– Ashley HomeStore in Corsicana celebrated the Grand Opening and Ribbon Cutting of its new 18,000 sq. ft. showroom located on 3203 Corsicana Crossing this week. Members of the Corsicana and Navarro County Chamber of Commerce joined Ashley HomeStore Licensee and employees at the event which included food, drinks, and tours. The official Grand Opening festivities began Thursday, April 5 at 10 am. Customers could register to win their part of $10,000 in give-a-ways including a $3500 shopping spree, Tempur-Pedic®, Beautyrest®, and iComfort® mattress sets, a 55” TV, Yeti® cooler, and BedGear® pillows. Plus, the first 25 customers on Saturday received a $25 gift card. The new store is owned and operated by Mark and Cheryll Wilks, who own four additional Ashley HomeStores in the surrounding region including Waco, College Station, Lufkin and Nacogdoches. The Corsicana store will employ approximately 15 people. Ashley HomeStore, the number one selling furniture store brand in the world, has more than 800 locations worldwide. The showroom features complete lifestyle vignettes, down to the final detail of lighting, rugs and wall art. Product categories include bedroom, dining room, upholstery, leather, occasional tables, home office, youth bedroom, recliners, mattresses and accessories. Technology enhances the environment, incorporating various elements to improve the customer shopping experience. Ashley HomeStore Corsicana’s hours are: Monday through Saturday 10 am - 8 pm, and Sunday 12:00 pm - 6:00 pm. Follow @AHSCORSICANA on Facebook to stay up to date with promotions and events. Ashley HomeStore is committed to being your trusted partner and style leader for the home. This commitment has made Ashley HomeStore the No. 1 furniture retailer in the U.S. and one of the world’s best-selling furniture store brands with more than 800 locations in 45 countries. Start designing your dream home today. Visit Ashley HomeStore online at www.ashleyhomestore.com. “Like” Ashley HomeStore on Facebook, follow us on Twitter and Instagram , or see our design-focused boards on Pinterest. Ashley Furniture Industries, Inc. (Ashley) feels that every person deserves more value for their money. Established in 1945, Ashley is one of the largest manufacturers of home furnishings in the world, and was recently named one of America’s Best Employers by Forbes in 2017. From design through fulfillment, Ashley is committed to delivering the world’s best home furnishing values, selection and service, and earning the loyalty and trust of its customers every day. Visit Ashley online at www.ashleyfurnitureindustriesinc.com and “like” Ashley Furniture Industries, Inc. on Facebook.